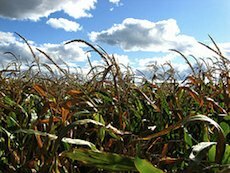 Monsanto Co., the leading seed supplier in the United States, will begin field testing of drought-resistant corn next spring, marking their first distribution of seeds genetically modified to withstand harsh environmental conditions. The seed giant announces these plans as states are experiencing extreme heat and record-breaking droughts, causing withered crops across the country, and especially in Texas. It is maintained that the genetically modified seeds will be used to prevent the potentially drastic loss of food supply in the future, and to help farmers who depend on it for income. These new genetically modified seeds will still need water in order to grow and thrive, but will use small amounts of water much more efficiently. The company plans to sign on with approximately 250 farmers in Nebraska, South Dakota, Kansas, Texas and Colorado to plant the seeds. The farms would be about 10,000 acres. Weather is one element that cannot be controlled by farmers, and despite controversy associated with the genetic modification of food, many farmers may be willing to look into any product that will allow them to grow crops through extreme weather conditions such as drought, extreme heat or flooding. According to the U.S. Department of Agriculture, there are crop losses as high as 15 percent each year as a result of drought and other harsh weather conditions. Water shortages also cost billions of dollars each year in crop shortfalls. Climate scientists are predicting drought conditions to worsen over time, which also contributes to the need for drought-resistant crops. If seeds are going to be modified, this sounds like a reasonable reason to do it. With this technology available, it could also be used to grow crops in countries where harvesting is difficult and causing food shortages. Do you think genetic engineering will be used in the right way in this case? Monsanto already has an incredible international monopoly on the genetic makeup of food, and thus owns most of the seed available to farmers. Crops will be drought-resistant (as much as we’ll find out from the trial test, which certainly will be obscured data) and farmers will “still be able to make a living,” but in reality it’ll be harder to make a living because the seed prices are 4 times more expensive than conventional seeds. GMOs are destroying both the environment and the local, non-industrial agricultural sector in the US, Mexico, and in India as well. If we do not step out of our desperately short-term mindset, we will lose the future. GMOs are eroding the natural balance of organic systems as we speak, from which Monsanto only benefits.